Troy Jackson is Oliver’s regional territory manager. He’s responsible for regional sales and customer relationships in the United States, Mexico and Canada. Jackson has a pervasive knowledge of Oliver equipment; he can describe the mechanical components of any given Oliver machine inside and out. When approached with a processing challenge, if a viable solution is possible, he’ll figure out how to obtain it. But this skill, expertise and professionalism didn’t sprout up out of nowhere. Jackson gained his knowledge over a combined 19 years at Oliver Manufacturing. Jackson began his career with Oliver in 1994. He started in the metal shop and, over time, transitioned up from one department to the next. Assembly. Testing. Woodshop. Press, Machinery. Nearly a decade after his first day on the job, Troy left the company for a role in sales. Five years later, he returned to Oliver in 2008 with sales experience and his welding certification. Over time, Jackson’s defined the type of salesperson he wants to be. Some salesmen will try to grease up their customers; bend the facts to make their product look more appealing, or omit information that might dissuade a customer from making a purchase. But that’s not how Jackson rolls. “I’m not a typical salesman,” he says. “I’m more of a technical salesman.” Jackson enjoys what he does because he doesn’t need to sugarcoat things. He’s free to speak intelligently and doesn’t shy away from technical details. He enjoys coming to understand a given product better and how Oliver’s solutions apply to it, and he can only reach that level of understanding through honest discussion with clients. His in-depth knowledge of Oliver equipment allows him to help his customers find the best solution for their needs– not something that is tempting to buy because it looks new and shiny, but something that actually works as defined by the customer’s needs. 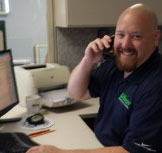 Jackson’s technical knowledge helps him assist not only customers, but agents and other Oliver employees, too. And with the ease of communication in today’s world of social media, Jackson really is only ever an email away. Though he travels less often than he used to, Jackson still prefers a face-to-face meeting over a direct Facebook message. “I’ve always been a firm believer in face-to-face,” says Jackson.